One of the most time consuming and frustrating tasks we encountered during our first 360 3D video productions was finding the optimal encoding settings for each of the currently available VR headsets. 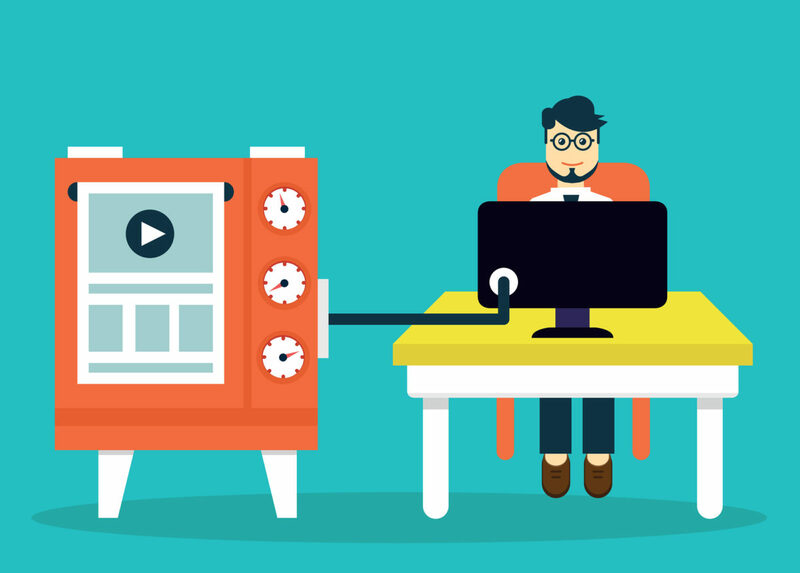 Each platform supports different resolutions, frame rates, codecs, and bitrates. This article explains the settings we started with, what we learned from analyzing some of the legends in the field (like Chris Milk and Felix & Paul), and finally we’ll share a simple yet powerful free tool we built to help you encode your VR video content with the best possible settings. Let’s go! We knew that the playback resolution wasn’t great, and some viewers, even though they loved the VR experience, commented on this fact as well. We told them that our camera filmed in a much higher resolution, but that we’re only able to display 25% of the pixels that we shot due to hardware limitations of the display devices. We also told them how you lose a lot of resolution since you spread the pixels out over the surface of a sphere, and then on top of that look at it through two big lenses which magnify each pixel of your phone screen (in case of Gear VR). Same resolution for Cardboard and Gear VR! Chris Milk, like most of us lesser mortals, is using the h.264 MP4 codec. However, the key is in the profile and level he uses. We encountered these settings often in our encoding tools, but usually didn’t pay a whole lot of attention to them. Now we know better.. The Baseline profile is primarily used for decoders with limited computing power, like mobile applications. Google also recommends the Baseline profile for h.264 video playback on Android. This makes it the go to profile for mobile VR, like Google Cardboard and Gear VR. The level describes the max resolution and bitrate acceptable. Each device supports videos up to a certain h.264 level. For example, iPhones only support videos up to level 3.1 (1920×[email protected] is the absolute max for iPhone 5.. so pretty appalling for VR video playback), while most Android phones will play level 4.2 videos just fine. The funny thing is that when you display this stretched/compressed video on the inside of a sphere for playback in a VR headset, everything is pushed back to the correct proportions again! And by using a resolution of 3840×2160 instead of 2048×2048 (what we initially used), Chris Milk has a whopping 97% more pixels to display! A massive improvement! Amazingly, he even uses this UHD resolution for the VRSE Cardboard app, something which we thought would not be playable! However, my 2 year old Nexus 5 phone is more than able to smoothly play these 4k videos, resulting in an amazing experience, even when using a low-end cardboard viewer. The downside of this resolution is that there is a limit at 30 frames per second. Higher frame rates simply won’t play on the current (mobile) VR devices at these resolutions. Chris Milk’s video The Displaced, a powerful story about refugees, is also used in the New York Times VR app for Cardboard. But while VRSE plays this video at 3840×2160 (stereoscopic), the NYT VR app plays this same video at a mere 1920×1080 (monoscopic). So, we just saw that using Chris Milk’s encoding settings can greatly increase your final video quality. Next to VRSE, the legendary Felix & Paul studio has been at the forefront of VR filmmaking for a long time, and a friend of ours from the Dutch production house Scopic mentioned that their Inside Impact video, featuring Bill Clinton, was one the sharpest looking VR video he had seen so far. So what makes this video so much crisper than other VR content out there? Well, a number of ingenious things.. In the screenshot you notice that you’re unable to see the bottom of Clinton’s desk. However, when viewing the video in the Felix & Paul Gear VR app, you can see the bottom of his desk. What kind of voodoo is this?! Well, Felix & Paul realized that only a limited number of pixels can be displayed as video on the current line of (mobile) VR devices, and they also realized that 95% of the action is happening at eye-height, not above or below you (this obviously varies with each piece of content). So their solution was brilliant: display only a certain band of pixels as video, and show the top and bottom parts as still images. This masterful trick allowed them to effectively achieve 3840×3840 pixels in resolution, of which only 1536 pixels in the vertical dimension are displayed as video, while the rest of the pixels are still images. This reduced amount of video pixels also allowed them to push their production to 60 frames per second! While the resulting viewing experience is unparalleled, there are some serious limitations to this trick. First, it requires a crapton of extra work and technical expertise to create a custom video player app which plays hi-res 360 videos and switches between top/bottom images in sync. Also, if you film something from a drone for example, where the bottom of the video does move, using still images there is no option. Nevertheless, a very creative way to push this new medium to its limits! But Felix & Paul didn’t stop there.. While the video is 9.21 minutes long, super high resolution, as well as 60 frames per second, the file size is “only” 825MB. Mediainfo teaches us that this is due to an, at first sight, rather low 12.3Mbps bitrate. Don’t let this bitrate fool you though, because instead of using the common h.264 codec, they encoded their files with the more powerful h.265/HEVC codec, which essentially gives you the same video quality at half the bitrate. So, we use h.265 for Gear VR to get an optimal balance between video quality and file size. If you would wish to play your videos at 60fps, Samsung recommends 2048×2048. For Cardboard Android we can use Chris Milk’s settings for the highest possible resolution. However, if you are concerned about file size, you feel that the Cardboard experience is sub-optimal anyways, or if you want maximum compatibility with older smartphones, you can always reduce the resolution to 2k or even 1080p, like the New York Times does. As mentioned before, iOS has put hardware restrictions on the maximum video size you can play on their devices, which is set to 1080p at 30 fps for iPhone 5 and 1080p at 60fps for iPhone 6. Because of this terribly low resolution and because developing for iOS is a torturous process, we are not a massive fan of VR for iPhone. However, many clients request it, so that’s why we included it in the list. For Oculus it is hard to determine what settings to use, because everyone’s computer will be different. However, based on Oculus’ minimum system requirements, it should in theory be possible to play high res, high frame rate h.265 videos smoothly, provided that the correct codecs are installed on the system and a powerful 360 video player is used. For now though, we use h.264 and UHD resolution for maximum compatibility since even our Mac Pro has difficulty playing h.265 files. For monoscopic videos (360 2D) the resolutions are slightly different. For example, the Gear VR can play 4096×[email protected] in h.264. Using Chris Milk’s settings, you should also be able to play this resolution for Cardboard on most newer Android phones. However, on Gear VR you could also opt for h.265, in which case the maximum resolution we managed to play smoothly was 3840×[email protected] This was on a Note 4 though. If you want 60fps, Samsung recommends 2880×1440. We did not test this resolution in h.265 yet. It has been more than a year since we wrote this post, and while most of the info is still accurate, some things have changed. For example, we now prefer to use Google’s VP9 codec instead of h.265, since it offers nearly the same compression as h.265, but also runs smoothly on Windows, although the new 1070 and 1080 Nvidia cards are somewhat capable of playing back h.265 now. We also recommend UHD (3840×2160) for Desktop VR now, since 4096×4096 is nearly impossible to play smoothly on any machine. Another interesting development is that some of the latest high-end phones, like the Google Pixel XL, are actually capable of playing UHD h.265 and VP9 at 60fps! Unfortunately we will still have to keep using 30fps for a while to ensure the majority of phones is capable of playing back the video. This open-source command line tool has full support for h.265 and is used to power most online video encoding services. It is great, except for the fact that learning the right commands and typing them over and over again is more frustrating than mowing the lawn with a nail clipper. That is why we decided to write a little Python script to make our life a bit easier. We now simply copy our hi-res, uncompressed files to an input folder, run the program, select which VR platforms we would like to render (Gear VR, Oculus etc. ), press “Start encoding” and then sit back to see our output folder fill up with perfectly rendered files ready for playback in the respective VR headsets! Jealous? Don’t be! Because we decided to make this tool available for free, nada, niente! This tool works, and the new version includes support for DPX/EXR sequences as well as a progress bar, but there is still plenty of room for improvement. If you are a programmer interested to improve upon this tool, then click here to find the latest source code. Let us know in the comments if you have suggestions for improvements! Hi guys, Brilliant wotk – really ! ! we are a VR start up in Germany and we are also into livestreaming 360° content for a German TV show. We are building our own 360° rigs and your tool seems to be very promising if not to say mega amazing. We would love to get access. Many thanks in davance , really looking forward to hearing from you. Hi Jan, glad you like our work! 🙂 What tool would you like to get access to? The VRencoder is free. I will inform you about my experience with this encoder. thanks guys. I am new in this vr and 360 tehnology but learning very fast. Nice blog post. Just a heads up, you can go all the way up to 4096×2160 or 2160×4096 at 60fps. I have this playing on the Note 5 or S6 in H265. So with stereo you can stack two images which are roughly 1:4 or .5:1 pixel aspect ratio depending if you want to loose resolution on your equirectangular image in the horizontal or vertical. The only catch is you cannot have a square texture, which is a major bummer, so no 4096×4096. Also I couldn’t get 4096×3840 to work either. Thanks for the tips! However, at those resolutions it wouldn’t play at 60fps on our Note 4’s. What bitrate are you using? My next goal is to try out cube maps and see if the quality is any better. If I make a 2×3 six pack into a 4096×2160 area, each 90 degree field of view of the cube will be 1365x 1080. This should give more resolution even for the pixels in the main FOV and remove pinching at the poles. Hi deke, do you have any links to your content or website? Do you Know “Felix & Paul” VR camera? Gopro? Codex? I can’t thank you enough for sharing your knowledge and experience. I’m just starting to teach these juicy new communication methods at my school, it’s an exciting time to be in visual storytelling! Could you add information if the youtube encoding includes metadata or not? The encoding does not include the YouTube metadata yet, so you’ll still have to use their little tool. You could in theory alter the source code of the encoder to also automatically change the metadata. Great article! I was wondering how Felix & Paul make their stuff so crisp! Really appreciate your sharing your knowledge with the community. Also, trying to download the encoder but never got the emails (not in my spam either). Would love to try it out! Wow, this tool is amazing, I can’t thank you enough! Do you by any chance know or have plans to release the presets for 180 degree video encoding? I can’t find that information anywhere, for either SBS or TB. Thanks Gerard, glad you like it! 🙂 I do not plan to release a 180 degree encoding tool, but I guess how it works is similar to 360, except half your image is black. Thankyou, I wait to get the link in high anticipation! Ive spent the last two days testing different settings and have become very frustrated. I just started reading about how difficult it is encoding moving water (My 360 video im trying to encode perfectly is from a drone moving over water) and stumbled across this page. Thank the lord 🙂 – How long does link usually take? Thanks again for your work here! Yeah I changed several settings on our email server, so hopefully the email with the download links will now be sent properly. For now I sent you the links manually, enjoy! I’ve too, sent my email sometimes back but hasn’t got the download link yet, can you be so kind? Should be in your inbox as we speak 😉 Contacted both our autoresponder and SMTP host to fix this annoying bug. They switched us to a new server (said it could have something to do with a bad IP address), so let’s pray everyone will receive the emails now. Nice stuff, thanks for sharing! YouTube asks for high bitrate uploads and then encodes them to lower bitrates for playback on YouTube. For 4k videos, YouTube recommends 65Mbps bitrates. Hi Nick, thanks in advance to share all your knowledge, really appreciate, thats the way to build a better VR world! Te VRencoder 0.9-OSX doesn’t work for me, I can choose input & output folders (items are in grey) and choose Gear VR for example, hit Start, and nothing happens, any progress bar, notification?. Yeah I’m not a pro Python programmer, so I did not manage to add a progress bar to it :-p We simply use Activity Manager on Mac to check how much CPU is being used by FFmpeg (the encoder). As long as FFmpeg is active, it means the VRencoder is still running. Not ideal, I know, but it should work! Hey Frédéric, same issue here, but I have nog command line expertise. Could help me by telling how you got it to work? tnx for the great article and information provided. I have also filled in the auto email form but did not receive an email containing the download link. Could you please sent it manually? Hi there, thank you for this post, i have filled my email address, could you send download link for me , thanks! you guys are just beautiful! Excellent post. Thanks so much for all this really useful information, this will save me so much time. I’m trying to download your great tool but I can’t receive the email. Hi Paul, we do not plan on this. We recommend using something like Unity to achieve this. Thank you for the script. Its been very useful. I have one question. I would like to animate moving objects in a static camera. Can I go this with a cube 6×1? Will the GearVR understand a cube 6×1 movie and format it correctly? I know this works with a still image. TY a lot, Gonna Try your encoder. Thanks for your work and information – keep up the great work. Great work 🙂 I also dug inside Felix & Paul video to find out how they do it – a real treasure! Did you try encoding an 8k video? I know it’s not yet possible to play smoothly on Gear VR, but hey, we want to get as future proof as we can with our works and google isn’t helping a lot. Right now the mp4 container isn’t even letting me do 4096×4096. Thanks a Millions for this priceless article ! Next time i go to Amsterdam i must offer you a drink guys ! When you create the timeline (in AE) with 3840×2160 30 fps and you stretch the video for TOP/BOTTOM view. What pixel aspect ratio do you configure you export settings? Thank you so much, this blog post is very useful. From Media Encoder we export in the highest possible resolution, 4096×4096 (1:1 aspect ratio) @ 60fps in CineForm, AVI or ProRes. Thank you for your awesome webinary yesterday about HeadJack multi head set apps. 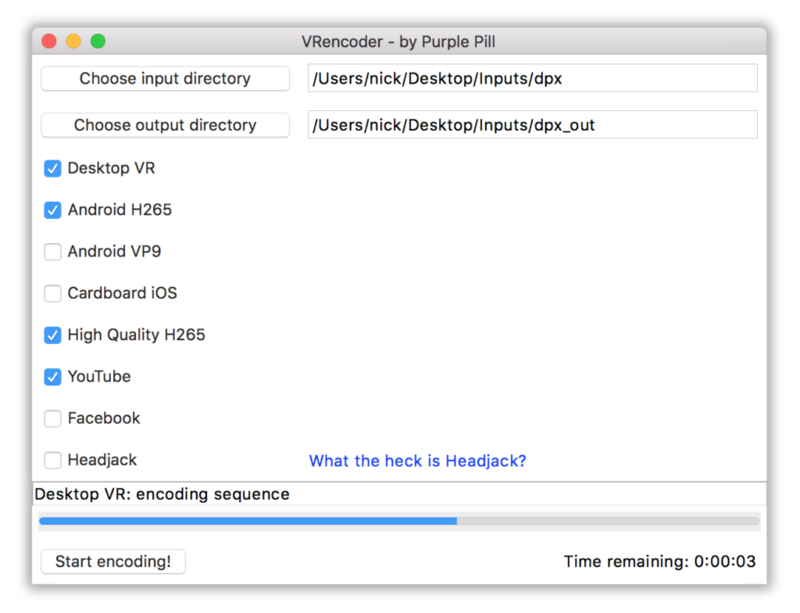 I’m using VREncoder 0.9.3 it works really well and fast on El Capitan OS X. My preferred preset is “High Quality H265” it works very well for 4096 x 4096 on Oculus Desktop. It seems to have around 60 Mbps. I wish I could use this same preset but with 30 Mbps, could you guide me how to make that change in the preset? This encoder is so clutch! I hope you guys continue to develop it. Can you maybe add an option to NOT resize the video when encoding? This is an absolute jewel! Thanks so much for making it and sharing with the community. As a filmmaker with just basic understanding of programming, I have a quick question: is there a way to tweak/modify some of the encoding settings the VR Encoder pulls and if so, where are they stored and how to edit them? Thank you very much for this so helpful post! For my part, I created a video from a sequence of images (from a digital simulation) for the GearVR. I use FFMPEG directly, to create my videos (because your software, VRencoder, takes videos in input only, it seems, but looks very powerful for video). However, my videos are not very smooth (jerks appear every 2 or 3 seconds), even when I reduced significantly the resolution or the bitrate. Have you ever encountered this problem? What is your line of code for the GearVR? Thank you for this post, it helps me a lot in my current project! However, one thing confuses me. 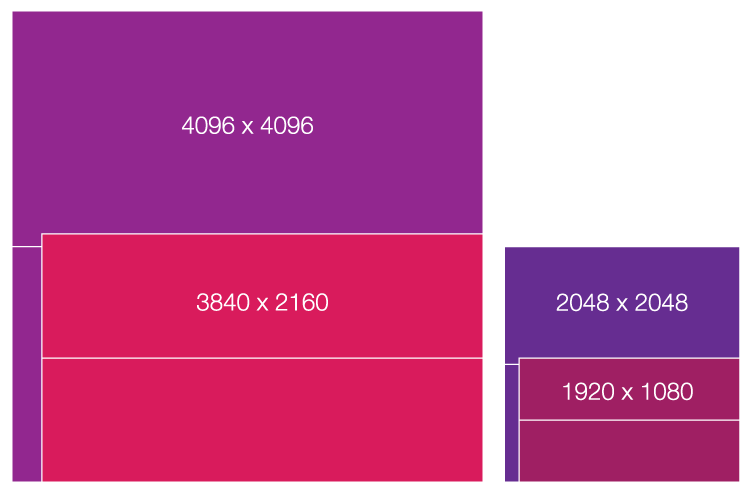 According to the Wikipedia article, the maximum resolution is 2048×1080 at level 4.2. How can Chris encode videos at 3840×2160 then? Yeah when we run this on Zencoder we also get a warning. It still encodes though, but it is not according to the exact standards. Thanks, I’ll check it out. Too bad Adobe Media Encoder won’t allow it. So, can I use on a vr video that often lags on my device to make it run smoother? Thanks for that interesting article and the free tool! I always tried to fnid the time to learn ffmpeg for exact that purpose. Now i don’t to spend my time on that anymore! Thanks a lot for this great tool!! Exactly the kind of tool I am looking for to encode 4k x 4k videos. My video is a .mov encoded in PNG. What input formats does the application support or do you recommend? Ok, found my issue. The input file really has to be uncompressed. The difficulty now is for the size on disk, but at least it works. If the tool has to be improved at some point may I suggest to output the command line for the ffmpeg exe? That would really help to debug and try things that are not possible through the UI. Hi Werwack, we accept mov, avi, and mp4 at the moment as input, but I’ve never tested a PNG encoded mov. The great advantage of PNG Mov is it is a lossless compressed video (8bpp though), it then saves a lot of space compared to uncompressed videos. Hi there, great approach. I am just struggling with my uncompressed version which is a DNxHD format. Any idea if I can convince this tool to read this? Or is there an easy way to convert to mov/avi/mp4? I have Adobe Premiere 13 Elements and tried some other tools unsuccessfully already. Hi Clemens, I have never seen a video in DNxHD format, so I do not know how VRencoder handles them to be honest. What is the file extension? And do you know if ffmpeg supports this format? Hi Nick, extension is .mxf. I doubt that I can fiddle around with ffmpeg with the chance of a good output result. But thanks for asking. I might get an uncompressed .mov file these days from a vendor. fingers crossed. Tour tool ils awesome, the Android profile rocks 🙂 besy qualité ever for the sise 😉 one of the n’est VR secret weapon !!! thanks a lot for your great post. I have actually a different question. Do you know where I can find 360 deg (full panorama) videos uncompressed? I couldn’t find such a database. I’m not aware of such a database either I’m afraid. like everybody else i want to thank you for this nice tool! I am creating stereoscopic animations rendered from 3dsmax and i am having trouble to get it run smoothly on occulus. Which player would you recommend to use for an animation with 4096*4096pixels / 60Fps? So far i tried the GoProVRPlayer from Kolor and the DeoVR-Player. We are about to update this article, because 4096×[email protected] is not really playable yet on most machines, but 3840×[email protected] is possible! in the meantime ive got the animation running smoothly with an 2880×2880 resolution 60Fps. Looking forward to that update! May i know what is the latest optimal resolution for monoscopic 360 videos for youtube, android, gearvr, and htc vive? We will update this post soon to reflect the latest info. How to add 360 metadata to the converted .webm file from Vrencoder? .webm is not recognized by metadata tool. I indeed noticed that… I just opened an issue for this on the Github page of the metadata tool and will revert the YouTube output from VREncoder back to h.264 for now. This is amazing, thanks for this. This means a lot to us who are just beginning, and there is not a lot of information out there. I just have one question: is this updated/does this still ring true for the Gear VR running on s7 phones? Hi, we plan to update it soon, but the majority of the info still applies. Awesome, thanks! Will be looking forward to this. Hi Nick, thanks for this amazing article. Such a good work that it still remains relevant even after being out there for quite a while now. Looking forward to the update as well, do you have an estimate of when it will take place? Hi Mark, the plan was this week, but my calendar filled up with other pressing issues. Cool, thanks for the prompt reply! Will keep a close eye on this then! Thanks for this encoder. Great idea! I can’t get this encoder to render a whole 38sec 3D 360 video, it renders about 10 sec and then just freeze (8h). I create the in-folder and out-folder. I put my video in the in-folder. Then double-click on the app and it opens. Then I have to choose a “source”. What is the source? the FFmpeg software? My video? Or what? I must choose a source to get the option to choose in and outfolders and also check the goal (e.g. YouTube). Would be happy for advice. Would it be possible for you to share your source video with me so I can test what is going wrong? If that is not possible, what are the specs (codec, bitrate, resolution etc) of your source video? What Mac device are you using with which specs? Selecting input and output folder and the desired output formats is all you have to do. I have a playstation vr and what would be the best encoding option be for it? Hi Aaron, we have not tested video on Playstation VR yet, so I can’t really say much about this. Would this info still be valid for 180×180 3D videos? I plan on getting the LucidCam ($500-$600, 3D 4K-per-eye at 30fps) if pic quality is as good as expected. -First- 4K just isn’t enough to cover 360×360 (too grainy). -And two- 95% of the time 360×360 is just a silly waste of resources (both storage and display-power). I don’t even want the cameraman to be in the picture most of the time! If the scene really does have more than 180×180 action, I’d probably still prefer two 180×180 cams with the cameraman hiding in between. Would also give me the option for only one cam being stationary, or at 45-deg angle “big bird” view, or “closer to group view”, while the other 180-cam being more mobile/focused on the main subject to be filmed. With a budget of $1000, can I get 180×180 3D 4K (6k?) 60fps with another product or some rig? I don’t mind doing post production as long as it’s a one-button job that runs overnight (very powerful PC). I don’t even care if the video cannot be played on smartphones until 2020… 🙂 This is strictly for home video purposes. Thank you for the lovely encoder & guide! I am encountering a strange problem with exporting to youtube. My input video resolution is 3840 x 1920. For some reason the youtube encoding option create an output video with 3413 × 1920 resolution. Thanks for the kind words! The YouTube setting indeed has some issues, I hope to resolve it in the coming weeks. Hi Bruno, did you shoot the video with an OZO? Those images sometimes result in a stitch line in the back. Or if your video is accidentally moved 1px during post. It can also be an issue in the video player you’re using or an encoding artefact. I just got a Vuze camera and it shoots good quality footage, but when I render through Adobe, parts of the video are SUPER blurry, yet other parts come out great. It’s like the quality improves as the video goes on. It’s like that whether I view it locally or through youtube. Any tips on what that might be? Maybe because of the way the title was implemented? or because I subbed out the audio for music? Hi Ian, hard to tell without example footage to see what is going wrong. Thank you so much guys! This is such a big contribution to the community and is a real help for indie artists like myself. I am playing a 360 Stereoscopic video inside unity (5.6, using the new Video Player), for the Oculus Rift. I would love to have a 3840×3840 texture, split for two spheres (one for each eye), so they don’t go out of sync. But since mp4 only supports 3840×2048 I’m not sure what other codec supports it but also plays in the unity player. As some readers told me, H.264/MP4 actually goes higher than 4k and can definitely encode to 3840×3840, you’ll just have to use FFmpeg for example to achieve this. Hello guys! awsome work! Thank you so much for sharing your hard earned knowledge for all of us to use! I am an indie developer starting in the industry. For a current project im exporting 360 stereo from unreal engine, on avi format at 4096 x 4096 top/bottom. I need the final video to be good for gear vr and youtube, what would be the best way to enconde them for that? Thanks for your email! For Gear VR, we recommend 3840×[email protected] in H.265 or VP9 at 15Mbit. 60fps might be possible, but you then have to multiply the bitrate with 1.5 and run some tests, because it depends which Gear VR device you’re targeting (S6, S7, S8). YouTube does not accept H.265, and does not allow 360º video metadata in VP9, so your best bet is a high bitrate H.264. For this we usually use FFmpeg or our VREncoder. It has cleared up my life in so many ways. I will now build an altar to worship you, for your generosity of information has elevated the ongoing suffering I have endured with codecs and outputs. HI. I’ve downloaded the app on my mac but when I try to open it I get an error. I am only able to open the terminal. Please advise. The new OSX version unfortunately has some issues with the tool I used to create the VREncoder. Haven’t had the time to sort this out. Could you recommend a good player for the Vive? Using Vive Video off Steam I’m getting nice results but on VP9 from about 15Mpbs and down there’s this one frame hiccup every second or three. I’ve even put the video file on an SSD in case it was that. The stutter also isn’t int he same place so it’s not the source video. The machine has a GTX 970 on it. I see your FFmpeg command has -b:v 1M in it, which means 1Mbps, not 15Mbps. Other than that it is correct. We use our own Headjack-based video player for Vive, but the GoPro VR player should also work. Also, try opening your VP9 file in Chrome, it should play smoothly in there as well, although it will not be in 360º of course. That way you can at least see if it is due to the player or something else. Well yes that was the last bit rate I used. I’m saying that from about 15 upwards there’s obvious performance issues within Vive Video. But from 15 DOWN to 1 it plays great except for small bump every second or two. Let me try that GoPro VR player and see if I get the same results. wont the 3.55:1 images have way more horizontal resolution than vertical resolution, giving a weird look? so wouldnt something like 2160 x 2160 be better then? at least the 2:1 images would give the same amount of angular resolution horizontally and vertically? Because the image is projected on the inside of a sphere, the video gets stretched to the correct proportion, so there is no weird look. Using 2160×2160 instead would not make any difference in the way it looks in the end, except for the fact that it will have a lot less pixels to display and so will show a lower quality image. Just so I get this straight, 3840×2160 for stereo is 3840×1080 per eye right? Or is it 1920×2160 per eye? 1080 pixels divided by 180 degrees gives 6 pixels per vertical degree. Almost half the resolution. Are you saying that the way latlong/equirect type distortion works, we need more horizontal angular resolution than vertical to give the same perceived resolution? Thanks for the guide. I’ve received the links to your encoder (thanks!) but am having trouble with the download – am only getting a max of 10kb/s & then it will drop out. Am on a cable connection so bandwidth is not an issue. Am not sure why this is happening – do you have a download mirror I could try? The only think it is that I didn’t find enough info about the Monoscopic settings. I am having some trouble to find the recommended export settings (monoscopic) for Oculus Rift. I did 4096×2048 at 30fps and bitrate 24Mbps. Doubts about level and profile..and not sure bitrate is ok.
Just less important for me now but curious: The export settings change if it is for Samsung Gear or Streaming like Vimeo or YouTube? I just used ffmpeg to “convert” my Gear 360 raw (stitched) file to .mp4. It is already in mp4 format but the filesize has gone from 1.8GB to just under 700MB, with seemingly no loss in quality. I have filled in my info but it will not give me the links. Just tested, and if you fill in your name and email, you first receive an email with the question if we’re allowed to send you emails. Once you confirm, you will receive another email with the download links. This does not work for you? I am trying to export 8k video for vr use in unreal. Is that acually possible? – Thanks for any hints! did you find an answer to your question? I am trying to get a stereo 6k video working in a unreal project, or at least export it in the best possible 4k qualities for Unreal. Which export settings are recommended ? Im from chile. I have a insta360 pro. Im wondering wich would be the best workflow for best resolution. By now im recording at 8K and the rendering in Insta360 stitcher at 4K – 30 fps – 60 mbps. After this using premiere for post, and the rendering at 4k (4096 x 2048) h264 at CBR of 20 mbps. Great article, one question though – you say that the best method of encoding for Android Cardboard is 4.2 baseline 3840×2160 30fps. However, on Media Encoder it’s telling me I need to up the level to 5.1 in order to use that resolution. Wikipedia only shows what 4.2 can do in 60fps, not 30fps, so no help there. Any advice? Thanks! Hi Aaron, you are correct, level 5.1 should be used for that resolution. We mentioned 4.2 back then because that was how the videos from WITHIN were encoded. Brilliant insightful article, I’ve filled out my name and email and confirmed subscription but still haven’t received the link to the encoder. Hi, Can you please suggest the best Encoding settings for Oculus Go? The Go can play up to 4096×[email protected] in some cases, but I would not recommend it, because the results have been mixed for people. However, you could play that resolution at 30 fps, or [email protected] in H265, similar to the Gear VR encoding.